This year each area of the shop is decorated in a different vignette that celebrates the Joy of Christmas. As you enter our foyer a red tree with “JOY” in giant red and white letters greets you, along with red garland festooned with faux candy canes and white gift-wrapped packages. 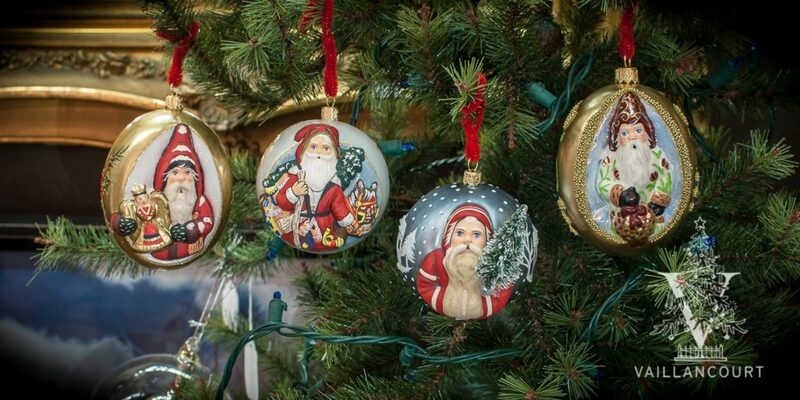 Come into the shop and a “Vintage” Christmas room catches your eye with Santa figures and ornaments in muted tones. Children of all ages will enjoy the “Letters to Santa” desk—take a moment to write a note to Santa, we will make sure it gets to the North Pole! Our new “Baby” room is all pink and blue with the softest and cuddliest animals around and gifts and accessories for little ones. As you continue through the shop each area will be sure to have you oohing and ahhing. The Nativity with beautiful Italian hand-carved angels, Vaillancourt and Hestia Nativities and Egyptian glass ornaments. A forest of evergreens and birches is host to flocks of birds, birdhouses and birdseed gifts. “Let It Snow” with a whimsical variety of “Snow People”. It is “Time for Christmas” in our elegantly dressed dining room with clocks, glass, silver and Classical Christmas dinnerware. There is a wonderful selection of ornaments, linens, candles, and accessories to enhance Christmas décor. We hope you can visit and experience the Joy of Christmas at Vaillancourt’s.